When studying art at the Academy of Fine Arts and Design in Ljubljana, media artist Evelin Stermitz also became interested in new media art. She started ArtFem.TV, “an artistic online television, platform and archive”, in 2008 as a way “to push more women in the arts and to raise the voices of women artists”. 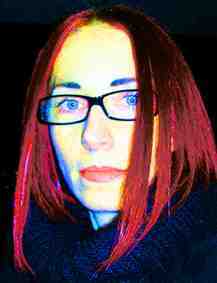 Red caught up with her at Rdece Zore festival to find out about her cyberfeminist projects. It began in 2008. My former professor Sreco Dragan, a very feminist thinker, gave me the contact to work with a company to create an online television. So I thought I would like to present art and feminism on a feminist art television channel. But after half a year, I left his company because we could not work together; they did not understand art and non-profitable work. Although I could use their server and online platform for free, I did not want this commercialised system anymore. So I stopped this collaboration and I created my own ArtFem.TV platform with my programmers. So it began. It is very easy actually. Also because I thought about my own video works, where can I publish them? I do not want to put them on YouTube and also not on my website. I sent out some email calls to mailing lists, if some women artists would like to contribute with their video works to this platform and so I got good feedback and very interesting works and collaborations. Why didn’t you want to use YouTube? There are so many non-professional things on it. I wanted the videos on an artistic platform. YouTube is very popular and there is too much information and many features; I intended to have a pure video site. Maybe YouTube is of valuable information some decades later to see how society worked at this time; as a source for a media sociology study. Also some artists are using YouTube to create artworks out of it in conceptual means. There is one interesting video art project by Natalie Bookchin entitled Mass Ornament (2009). She collected video works of young women dancing, all around 16/17 years old. Everyone is dancing the same dance alone at home. No it is not a play. It has this idea of TV also, because you can pick up the works from the different channels at the site. You have video art, performance, documentary, short film…so you can select what you would like to see, like an artistic online television screen, a TV screen for the art of and by women. Do women donate their works to you? Yes. First, in 2008, not so many works have been online on the net in general. So I got DVDs sent, then I converted them and put the videos online, it was a rough job. And lately, a lot of works are already on the internet, so I could download them and transfer them directly to ArtFem.TV. But of course, I am asking the artists. Either I am contacting them, or they are contacting me. Is ArtFem.TV voluntary or are you paid? It is voluntary. I do not have any budget but just my time as input and ArtFem.TV as output. I am doing this on my own. The only thing I got for free is the server, so I do not have any costs for this space. It is hosted on an artistic server in Graz - mur.at. Also the web design was a friendship work by my brother in law Torbjoern Karlevid and his friend Vincent Van Uffelen. ArtFem.TV is voluntary but I think that women artists can benefit of it. People are looking it up. I got very good responses from theoreticians that they are using it in their classes to show examples. Also curators are looking it up for exhibition selections. Do you have any selection criteria? The criteria is that it should articulate women’s topics or gendered issues. Either in a poetic way or critical way or radical way; to issue these fields of women’s articulations. I have the opinion that a lot of women are not articulating themselves or their issues. Because they are subordinated under these male structures and they think only these male structures are working and important. These male structures are the field of our discourse and the field of our law. Of course we are still living in a male world. Is it just professional artists you have on ArtFem.TV? Well, I would say that most of these artists are professional artists. But I found one very interesting statement from a woman who is a singer in her spare-time, but her statement was so very strong so I put it on the website too. On the website there are very young artists, I would say around 30 but also many artists from the older generation, like Martha Rosler. She gave me permissions to use her video works on the website, and also so did Nina Sobell. These are all artists from the generation of the 70s. There are many generations on the website. Do you see any differences in the works of women from different generations? Yes. I would say, first of all, technical of course. First video works are black and white and the editing was not always possible. These are experimental videos. Nowadays videos are very colourful, are perfectly software edited, influenced by popular culture. The second aspect is a variation from the aspect of content. Maybe in the 1970s they articulated the issues stronger, and there was also this strong bodily discourse. But it is not really true, there are contemporary video works online which are very radical and strong, but in contrast to this also very sublime works. I would not say not so much variations from the content itself, but maybe just from the structure. This happens because the video works are influenced by its time of production and since feminist issues are societal issues, society changes over the time, and with this the works of the artists. Of course a pop generation is articulating gender issues different, also within this Riot Grrrl’s movement, and femininity and sexuality is articulated different, found new negotiations. In the 1970s video works were more connected to the body, circling around this field of women in a private space, also household space, and definitions of women in this space, like mother, cook, sexual object, consumed object. Martha Rosler did this, Nina Sobell did this. And later it became more connected to this public field. How women articulate themselves in public spaces and also in a media space. Of course the critic on media representation of a women’s commodified object from the 1970s was before, but for example, there is one contemporary artist, Michelle Handelman from New York, she articulated this issue very impressive in this hyper-mediated societal context in her work I Exist, as the constitution of a being in a hyper-mediated society. Also maybe works became more sublime, in a way non-direct, but this varies by the artist. In the 70s, maybe it was more direct, but maybe this is our perception nowadays. I think women artists are thinking about their medial positions in society like they did in the 70s, but in a 21st century context and background. I think this is a proceeding dialogue without any significant break in it. No this is not true. Because also Nina Sobell, especially in her “Chicken” videos, articulated ironic gendered subject positions in early video art. Or if you think of Martha Rosler in the kitchen, it seems to be harsh, but it is dealing with the irony of language speaking the subject. It was already there, you know. Irony and contradiction combined with a woman’s reality and her experiences in a male society was always addressed as a representational position, also in media and their critique. Of course the first discourse was TO establish A SUBJECT. Maybe this discourse is dissolving, since gender binaries are dissolving and the subject positions changed slightly therefore, and it is to find other issues, leading away from a binary discourse, or influenced by other cultural movements. But in general I would say no. But the constitution of a (female) subject in a male society is a process of modern and post-modern society in general. Either it is dealt with harsh seriousness or irony, or in a sublime way, the constitution of a subject is always in the foreground, however you would like to pin it down, gendered or toward a non-gendered society. What are the challenges or obstacles of producing ArtFem.TV? I think the hardest thing is the time. And tiring and exhausting work in front of the screen. Sometimes I worked 16 hours a day, 24/7. This was in the first year. The last half year was not so exhausting then anymore, because all the first pressure of establishing the project has been released. Computer work is very tiring and can damage the body seriously, in my opinion. Because excessive computer work can mean that you cannot sleep anymore, inside your brain you feel electrical flashes and you have problems with the body’s movement, paranoia to lose all the data, and so on. I have had these problems. Sometimes I thought I need 2 days off from the computer, but it was not possible. Now I am taking the time and do not work so excessive anymore, sometimes. But I’m happy, you know. I’m happy that it worked out fine and that people like it and find it interesting. That is the most important thing. How did you come into feminism? I was influenced by my own experiences at the art academy, at the art market, meeting male artists, meeting male persons in general and discussing topics with them. Partly they didn’t understand or had different perspectives. Art and feminism is really a field which is not open to everyone. I thought it was important to articulate that, to create an ongoing discourse, and also to open fields up. I have the opinion that it really does not help much to articulate these female issues only to women or the same gender. Male people should change their thinking, or opinion, or behaviour somehow. In general, my opinion is that everyone of us is gendered and an exclusive discourse is splitting up much more, rather then constructing new visions of gender aspects. I call myself a third wave feminist. Because the feminist movement is a long movement and if no one is talking about it anymore it is losing its power and still a lot of things are not reached yet. So it is going backwards. Well, I would say maybe third wave feminist or cyberfeminist. I am not one of the persons who are engaged in feminist issues, but then don’t name it, for whatever reasons. Cyberfeminism is a movement to reconstruct the internet media in an active way by ironic citations, quotations, breaks – to remap the Internet with a feminist bent. Maybe it is not a big counter movement in a massive way, but it is something. Because the Internet is like all media, a male media and structured by male power, opinions and visions. There have been early cyberfeminists in Australia - VNS Matrix, and other pioneers. They really created very explosive and influential projects. Very shocking maybe to male persons, but also playing with their visions. And with this movement of the Australian cyberfeminists a lot of other projects came up. They influenced a lot of other feminist thinkers through using the internet in this way. This was in the 90s and later. A lot of theoretical work has been done and not to forget the Cyberfeminist International meetings at Documenta X in Kassel, Germany, 1997. Does cyberfeminism just happen online? It happens online but they are thinking outside. It is relocating and remapping thoughts over the Internet. I think it is very powerful because it is reaching everyone. Also within the Old Boys Network collective, the intellectual community is very powerful. They have very interesting theoretical texts on their website and they are infiltrating also the old male art system with this collective in a way. There was one great net art exhibition in Germany where Cornelia Sollfrank [http://www.vdb.org/smackn.acgi$artistdetail?SOLLFRANKC] submitted a project entitled Female Extension with the net.art generator [http://net.art-generator.com/] where she faked women artists with net art projects (Galerie der Gegenwart der Hamburger Kunsthalle, 1997). The jury was very surprised about the fact that so many women submitted their projects. But she faked it. She invited coders to set up four or five software systems – these serving like coders or programmers for the net art works. You can type in a name or some content and they create a net art project for you. It was very clever and sophisticated. It showed that the art system is still male. If you go to group exhibitions in art institutions in Austria or maybe also more far in Europe, in general from ten artists, two or three are women and the rest are male. I did not make a survey on this, but I guess, I am not so much wrong. Is feminist art a form of activism? I think also what a friend of mine, Deb King from Detroit, says, that art is always informing. It is mirroring the society on the level of a critical discourse and it is informing people’s opinions. Maybe if it is only shown in these gallery circles it is not so much influential, because the gallery visitors are already educated about ongoing discourses maybe. But if it is going outside and happening more public, like on festivals including panels and workshops as here in Ljubljana or other places, it is reaching much more people in an inclusive way. But feminism can also be very much extreme. For example the Festival International du Film Lesbien et Féministe de Paris does not even allow male people from the press to attend the festival, so it is very excluding and binary, but maybe this is their tradition and statement. Do you have any involvement in queer? Queer theory or queer activism? I think it all comes together with feminism and I think feminism is not only there for women. There are also a lot of other gendered people who are suppressed or marginalized or are suffering from social exclusion or are under social pressure. So of course, all this comes together and is important. I think our society should become very vivid and open to all kind of gender theories or sexes or whatever. Queer is an option of this. But I am not a queer theoretician or queer activist. In a sense that art and our society should be open to everyone, everyone should be involved and no one left out. Queer is for me a fluid option of a more gentle society structure without binary power structures.